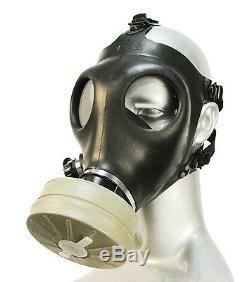 Israeli IDF Civilian Adult Gas Mask. Unused Sealed Mask, Filter & Drink Tube. The mask is sealed in the original box. Same situation as It left the factory. With Hebrew English Russian & Arabic Manual. Made from rubber material for high resistance. Lightweight and specially designed for extended use with superior comfort, secure fit, and low breathing resistance. The adult model 4A1 respirator incorporates a uniquely designed peripheral sealing lip affording a high level of protection for most mature male and female users. Specially formulated impermeable rubber material for high resistance to NBC agents. Impact resistant plastic lenses with excellent optics. Comfortable nose cup with controlled air flow to eliminate lens fogging and CO2 buildup. Five-strap, highly elastic headharness equipped with quick release, simply adjusted release buckles for quick and easy donning. Voicemitter providing clear and effective communication. Drinking system with safety connections, for effortless safe drinking in contaminated environments. Put the syringe in a garbage can life dangerous! 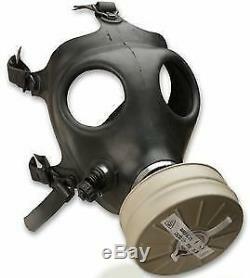 The item "New Gas Mask israeli IDF Civilian 2013 Adult in box free Worldwide shipping" is in sale since Friday, February 1, 2019. 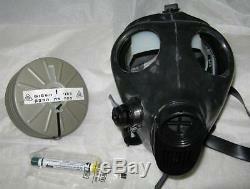 This item is in the category "Collectibles\Militaria\Surplus\Personal, Field Gear\Gas Masks". The seller is "2015ud8" and is located in holon. This item can be shipped worldwide.